Hans Bethe, one of the true giants of twentieth century science, was also one of Adolf Hitler's greatest gifts to the United States. Fired from his position at the University of Tubingen in 1933 because of his Jewish ancestry, Bethe moved first to Britain and then, after an invitation from a former colleague, to Cornell University in 1935. At Cornell he loyally stayed put for the next 70 years, establishing one of the world's great centers of physics. During this time he became one of the most prolific physicists in history, a true generalist contributing major insights to fields as diverse as nuclear physics, astrophysics and nuclear reactor analysis. He was a superb teacher, and counted both Richard Feynman and Freeman Dyson among his august students. He served as director of the theoretical physics division of the Manhattan Project at Los Alamos and then, after he midwifed the birth of one of humanity's most violent creations, spent the rest of his life tirelessly campaigning for its control and elimination. Bethe won the Nobel Prize in 1968 for figuring out one of science's greatest puzzles - the mechanism of energy generation in stars. He consulted for at least five presidents, served on many government committees and was actively working on supernovae when he died at age 99. He combined great scientific gifts with even greater human gifts; he was widely known as the conscience of the physics community. Perhaps no other evidence exists of Bethe's indomitable leadership of science in the United States and his loyalty to this country than the letter he wrote to Arnold Sommerfeld. Sommerfeld was one of the greatest physics teachers of the century, and under his tutelage flourished such outstanding physicists as Bethe, Heisenberg, Pauli and Debye. Sommerfeld was very fond of Bethe, offering him a position in Munich after Bethe had been fired from Tubingen. He stayed in Germany during the war, trying to precariously hold on to German science under the onslaught of the Nazis so that it could be built up again after the war. 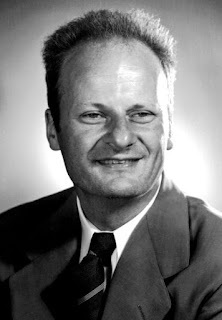 One of the foremost ways in which he intended to do this was to try to bring back his former student Hans Bethe. To incentivize Bethe, Sommerfeld who by this time was close to retirement offered Bethe his own chair of physics at Munich. This was a very tempting and distinguished offer. In response Bethe wrote what must be one of the most moving letters from one scientist to another, from a student to a teacher, and from one human being to another for that matter. It is worth copying out in its entirety because it showcases words like "loyalty", "affection" and yes, "patriotism" in their most genuine form. It also showcases American physics during one of its great ages and tells us what it was about the United States that made it so attractive to people from all around the world. The italics are mine. I am very gratified and very honored that you have thought of me as your successor. If everything since 1933 could be undone, I would be very happy to accept this offer. It would be lovely to return to the place where I learned physics from you, and learned to solve problems carefully. And where subsequently as your Assistent and as Privatdozent I had perhaps the most fruitful period of my life as a scientist. It would be lovely to try to continue your work and to teach the Munich students in the same sense as you have always done: With you one was certain to always hear of the latest developments in physics, and simultaneously learn mathematical exactness, which so many theoretical physicists neglect today. Unfortunately it is not possible to extinguish the last 14 years. . . . For us who were expelled from our positions in Germany, it is not possible to forget. Perhaps still more important than my negative memories of Germany, is my positive attitude toward America. It occurs to me (already since many years ago) that I am much more at home in America than I ever was in Germany. As if I was born in Germany only by mistake, and only came to my true homeland at 28. Americans (nearly all of them) are friendly, not stiff or reserved, nor have a brusque attitude as most Germans do. It is natural here to approach all other people in a friendly way. Professors and students relate in a comradely way without any artificially erected barrier. Scientific research is mostly cooperative, and one does not see competitive envy between researchers anywhere. Politically most professors and students are liberal and reflect about the world outside—that was a revelation to me, because in Germany it was customary to be reactionary (long before the Nazis) and to parrot the slogans of the German National ["Deutschnationaler"] party. In brief, I find it far more congenial to live with Americans than with my German "Volksgenossen." On top of that America has treated me very well. I came here under circumstances which did not permit me to be very choosy. In a very short time I had a full professorship, probably more quickly than I would have gotten it in Germany if Hitler had not come. Although a fairly recent immigrant, I was allowed to work and have a prominent position in military laboratories. Now, after the war, Cornell has built a large new nuclear physics laboratory essentially "around me." And two or three of the best American universities have made me tempting offers. I hardly need mention the material side, insofar as my own salary is concerned and also the equipment for the Institute. And I hope, dear Sommerfeld, that you will understand: Understand what I love in America and that I owe America much gratitude (disregarding the fact that I like it here). Understand, what shadows lie between myself and Germany. And most of all understand, that in spite of my "no" I am very grateful to you for thinking of me. "You are not only an outstanding scientist, you are also a devoted public servant. The nation has asked for your help many times and you have responded selflessly. You have made profound contributions in the fields of atomic energy, arms control and military technology. And you have been an important source of the immense contribution which science and the university community are making to society as a whole. Our country is deeply indebted to you." During a time when words like "patriotism" inspire cynicism and are often being used as fig leaves for hiding ulterior motives, Bethe's letter should be required reading for those who have forgotten what this country stood for, how its ethos of openness and excellence attracted talented men and women from around the world, and how the people it welcomed with open arms became true patriots. As we simmer in an election season in which we seem to be awash in slogans rousing the emotions of the lowest common denominator, Hans Bethe's moving letter to his former teacher should hopefully remind us of the best that this country can offer. Letter source (which saved me the trouble of typing it out): The original can be found in both Silvan Schweber's biography of Bethe titled "Nuclear Forces" as well as Schweber's superb contrasting study of Oppenheimer and Bethe, "In the Shadow of the Bomb." Thanks, Ash, I like this. But if I may offer a correction, Bethe was fired in the mass dismissals of Jewish academics in April-May 1933, not 1935. He can also be considered as the "father" of Crystal Field Theory. In his Memoirs, Edward Teller says "Before I was ten, I understood that in the United States foreigners are not foreign." I guess they had similar feelings about the US. Bethe's contribution to CFT needs to be better appreciated. Maybe I will write a post sometime. Thanks. Can you give the source of the letter (e.g., from which book)? It's from Silvan Schweber's biography of Bethe: "Nuclear Forces". Einstein's letter to Max Planck's widow upon Planck's death is also worth quoting. I've seen the whole thing, but can't find a copy; only this excerpt. Planck, of course, also stayed in Germany during the Nazi era, and died about a month before Einstein wrote the letter. It has a somewhat different tone than Bethe's letter to Sommerfeld, but then again it was not in response to an offer to return to Germany. Thanks for the excellent reference. I will take a look at Einstein's papers.